further to amend the Drugs Act, 1976, in its application to Province of the Punjab, for control and eradication of spurious, adulterated and substandard drugs. It is essential further to amend the Drugs Act, 1976 (XXXI of 1976), in its application to the Province of the Punjab, inter alia, for coping with the increasing menace of spurious, adulterated and substandard drugs, for provision of quality drugs to the people by updating the enforcement mechanism and providing an operative and regular monitoring system and stricter penalties, and for ancillary matters in the manner hereinafter appearing. 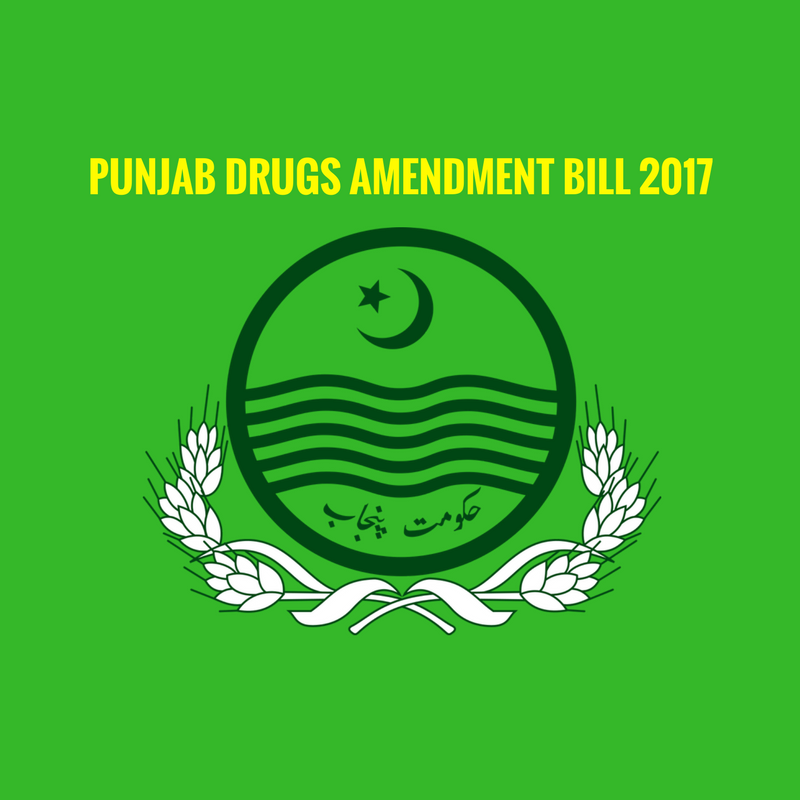 Short title and commencement.– (1) This Act may be cited as the Punjab Drugs (Amendment) Act 2017. (2) It extends to whole of the Punjab. (ze) “professional member” means a person who is qualified for appointment as Inspector or Government Analyst and appointed by the Provincial Government in such manner and on such terms and conditions as may be prescribed.”. “(7) The Provincial Quality Control Board may constitute a committee or committees, consisting of the members of the Board and other persons including at least two professional members and delegate to the committee any of its powers and functions under subsection (5) for exercise within the specified area.”. “11B. Provincial Drugs Monitoring Teams.– (1) The Provincial Government may, by notification, constitute one or more Provincial Drugs Monitoring Team consisting of the Chairperson and members including at least two professional members on such terms and conditions as the Provincial Government may determine. (2) The Chairperson and members of the Provincial Drugs Monitoring Team shall hold office during the pleasure of the Provincial Government. (3) The Provincial Drugs Monitoring Team shall, with the approval of the Provincial Government and by notification in the official Gazette, make regulations to regulate the conduct of its business. (f) perform such other functions under this Act or the rules as the Provincial Government may, by notification, assign. 11C. Independent inspection.– (1) Subject to subsection (2), the Provincial Government may, on the recommendations of the Provincial Quality Control Board, engage the services of a consultant or a firm of consultants for independent inspection and evaluation of units for manufacture of drugs, distribution networks or sale-points as the Government may specify. (2) No person shall be engaged as consultant unless he is qualified to be appointed as an Inspector or Government Analyst and is an expert in the relevant field and no firm shall be so engaged unless it has inhouse capacity for the task and has in its service persons who are qualified to be appointed as Inspectors or Government Analysts and are experts in the relevant field. (3) The consultant or the firm of consultants shall submit the report to the Provincial Quality Control Board within the specified time and the Board shall take necessary action on the report in accordance with law. (4) For purposes of inspection and evaluation, the consultant or the experts engaged by the firm of consultants shall have the powers of an Inspector. “15. Provincial Drugs Testing Laboratory.– (1) The Provincial Government shall, as soon as may be, set up one or more Provincial Drugs Testing Laboratory for such purposes as may be prescribed. “(i) one portion or sample he shall send to the Government Analyst or, if so specified by the Provincial Quality Control Board, to the Board for sending it to the Notified Drugs Laboratory.”. (3) in subsection (5), after the words “Federal Government”, the words “or the Provincial Government” shall be inserted. “22A. Reports of the Notified Drugs Laboratories.– (1) The Notified Drugs Laboratory shall submit its report to the Chairperson of the Provincial Quality Control Board. (2) The provisions of section 22 of the Act shall as far as may be, apply to the report of a Notified Drugs Laboratory. “23A. Prohibition on aiding, abetment or association in contravention of the Act.– No one shall participate in, associate or conspire to commit, or attempt to commit, aid, abet, facilitate, incite, induce or counsel the commission of an offence punishable under this Act. conceal or disguise the true nature, source, location, disposition, movement, title or ownership of such assets by making false declaration in relation thereto. (3b) Whoever himself or by any other person contravenes the provisions of section 23B shall be punishable with imprisonment which may extend to ten years but which shall not be less than three years and with fine which shall not be less than the prevailing value of the assets and such assets shall also be liable to forfeiture to the Provincial Government. (3c) Whoever himself or by any other person contravenes the provisions of section 23C shall be punishable with imprisonment which may extend to fourteen years but which shall not be less than five years and with fine which shall not be less than the prevailing value of the assets and such assets shall also be liable to forfeiture to the Provincial Government. shall, without prejudice to any other action in accordance with law, be liable to imprisonment for a term which may extend to three years but which shall not be less than six months and with fine which may extend to one million rupees but which shall not be less than one hundred thousand rupees.”. “27A. False statement.– When any person is required under the Act to prepare a report, make a statement or furnish an information, prepares the report or makes the statement or furnishes the information which is false in any material particular and which he knows or has reasonable cause to believe to be false, or does not believe to be true, shall be punishable with imprisonment for a term which may extend to three years but which shall not be less than six months and with fine which may extend to one million rupees but which shall not be less than one hundred thousand rupees.”. (4) in subsection (3), for the expression “seven years, or with fine which may extend to one lakh rupees or with both”, the expression “ten years but which shall not be less than ninety days and with fine which may extend to ten million rupees but which shall not be less than one million rupees.”. all offences under this Act shall be non-bailable. (2a) No court other than a Drug Court established under this Act shall try an offence punishable under this Act.”. (2) subsection (7) and subsection (8) shall be omitted. “31A. Appeal.– (1) The Provincial Government or the person sentenced by a Drug Court may, within sixty days, file an appeal against the final order of the Drug Court to Lahore High Court and the appeal shall be heard by a Bench of that Court consisting of not less than two Judges. (2) The Drug Court shall, as soon as possible, supply copies of the final order to the parties free of cost. (3) The provisions of sections 5 and 12 of the Limitation Act, 1908 (IX of 1908) shall be applicable to an appeal under this section.”. “41A. Suspension of license by Provincial Quality Control Board.– (1) Notwithstanding anything in section 41, the Provincial Quality Control Board may, subject to the conditions mentioned in that section, and after affording an opportunity of hearing to the manufacturer and recording detailed reasons including the grounds of suspension, suspend the manufacturing license of a manufacturer within the Punjab for such period not exceeding thirty days as the Board may determine and shall, as soon as may be, report the matter to the Central Licensing Board for such action as the Board may deem appropriate. (2) A copy of the order under subsection (1) shall immediately be supplied to the manufacturer, requiring him to take appropriate remedial measures. (3) The manufacturer shall take remedial measures and shall request the Provincial Quality Control Board for an immediate inspection of the unit, and the Board shall promptly arrange an inspection. (4) If the Board is satisfied that the grounds leading to the suspension of the licence have been remedied, it shall restore the licence of the manufacturer and report the matter to the Central Licensing Board but if the Board is not so satisfied, it may require the manufacturer to take the remaining remedial measures. (5) Notwithstanding anything in subsection (3) or subsection (4), the Board shall arrange inspection of the Unit for manufacture of drugs at five days prior to the expiry of the period of suspension and if it is of the view that sufficient remedial steps have not been taken, the Board may, from time to time and after recording reasons, extend the period of suspension up to the maximum period of ninety days in all. (6) If the manufacturer does not take effective remedial steps during the period or extended period of suspension of the licence, the Board shall refer the matter to the Central Licensing Board for immediate cancellation of the manufacturing licence. (7) Any manufacturer aggrieved by the order of suspension may, within seven days from the receipt of the order, prefer an appeal to the appellate authority as notified by the Government and the appellate authority shall dispose of the appeal maximum within seven days.”. Insertion of section 43A of Act XXXI of 1976.– In the Act, after section 43, the following new section 43A shall be inserted. “43A. Power to delegate.– (1) The Provincial Government may, subject to such conditions as it may determine, delegate any of its functions to the Provincial Quality Control Board or to any other person or authority. (2) The Provincial Quality Control Board may, subject to such conditions as it may determine, delegate any of its functions and powers under this Act or the rules to the Monitoring Committee or any other person or authority.”. In consequence of the Constitution (Eighteenth Amendment) Act 2010, the subject of drugs/medicines was devolved to the provinces on abolition of the concurrent legislative list of the Constitution. Accordingly, the Drugs Act, 1976 came within the legislative competence of the provinces in terms of Article 142 (c) of the Constitution. It is imperative to strengthen the provincial institutions such as Provincial Quality Control Board, Chief Drugs Controller office and the Drugs Testing Laboratories in the Punjab. People of the Punjab may not be exposed to the perils of spurious and substandard drugs. It is, therefore, essential to amend the Drugs Act, 1976 in order to cope with the emerging menace of spurious, adulterated, substandard, counterfeit and illegal drugs. The prime object of the proposed amendments in the Act ibid is to plug the loop holes in the existing provisions of the law and to enhance the punishments for the persons involved in the offences relating to spurious and substandard drugs. Hence this Bill.